In Kholep Vangkho village in Manipur, 31-year-old Lamneichong, a hard-working mother of 4, weaves traditional shawls and wraps long after sunset by the light of her solar-powered bulb. The money earned by selling these woven products pays for her children’s education. Earlier, Lamneichong wove in her spare time. Tending to 4 children all day while her husband was at work, most of her spare time was at night – without electricity, she couldn’t get much weaving done. A Milaap loan helped her buy a 45-watt solar home-lighting system, giving her precious hours to work and earn after sunset. Many women and their families in developing areas of India need such solar lighting alternatives, to weave and earn, and study past sunset. In Manipur, India, Milaap and WSDS have partnered to empower such women to meet their productive needs, like solar light. Simple loans provided by Milaap’s lending community help these women buy 45-watt solar home-lighting systems with 4 bulbs that can light up adjoining rooms in their homes – the women can work past sunset, and their children can study. 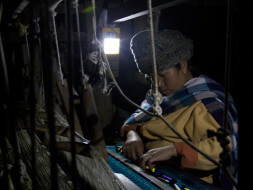 The cheap, renewable lighting opens up opportunities for a better future to these families of Manipur. Great going Amrita, glad to be a part of it! !